Summary: The big accomplishment this week was that Houa glassed in the 2 shelves above the forward salon ports. To do this, Baw first had to finish the gelcoat work under the shelves, in front of the ports. Baw also finished the gelcoat work on top of the targa‑bar and put gelcoat filler around that foredeck area and the underside of the bimini and started sanding it smooth. One of those forward ports had to go to the machine shop to get the bolts removed, as they were solidly stuck. Houa spent much of the week sanding the edge of the deck, cleaning up where it joins the toe‑rail and making sure the deck is flat. 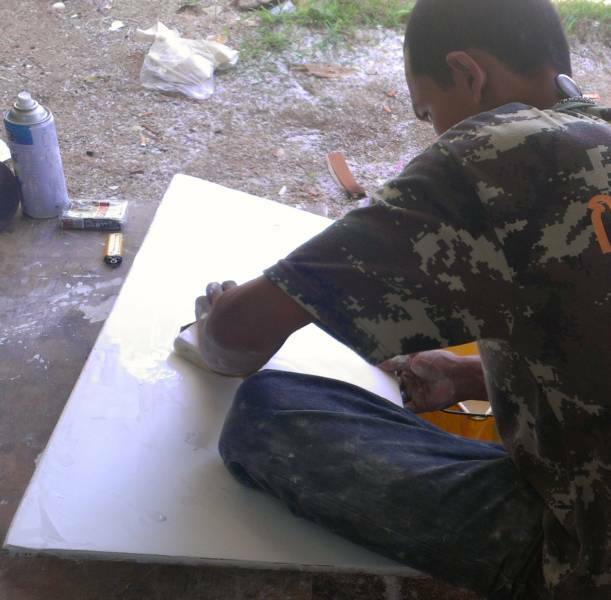 Houa also cut out and trimmed down all 12 sheets of acrylic for our hatches. 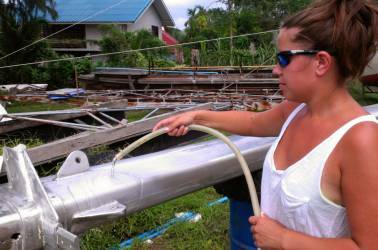 Amanda accomplished a lot of polishing on the mast, and even more on the boom - only one of the 4 sides of the boom still needs polishing. And on the mast we did a finish sanding and applied our first layer of Nyalic on a test‑section just above the first spreader. The hinges and finger‑pulls for the 2 new hatches were laid out, drilled and de‑cored, and Houa filled them with epoxy mud so they can be tapped. 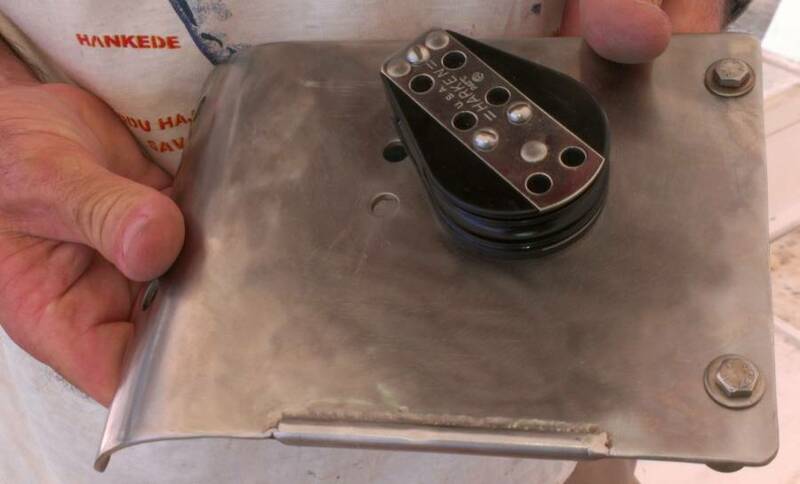 Jon replaced a broken davit block and mounted it to its stainless steel plate. 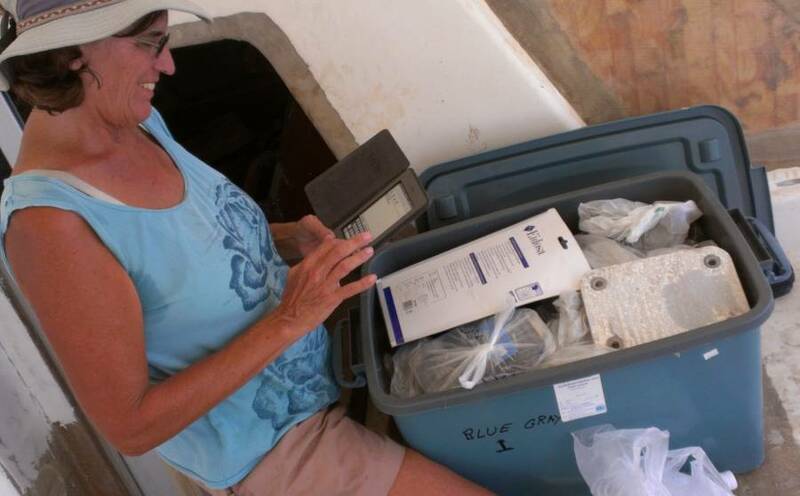 Sue and Rachel organized and inventoried much of the gear on Ocelot and moved several items to the storage unit. Finally, Barak Obama won the US Presidential election (to much relief here) and Amanda got scooter driving lessons and now there's no stopping her. Both Baw and Houa showed up for work today, but many of the rest of the folks at the boatyard didn't - not sure why. 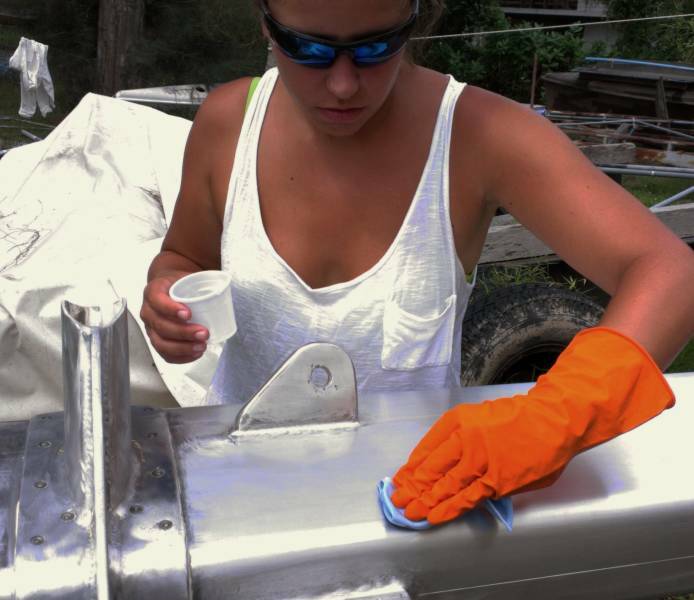 The big news is that Baw and Houa started gelcoating the bimini. In the morning Jon had "finger‑sanded" the small bits that the big orbital sander had missed, gaining one blister and losing a couple of fingerprints. After lunch the guys checked the bimini over, discussed it among themselves, and started mixing gelcoat filler (gelcoat with fillers in it - can't be sprayed and is usually applied with a paddle). They may have run out of fillers as they stopped after coating only half the bottom of the bimini, but at least it's a start. 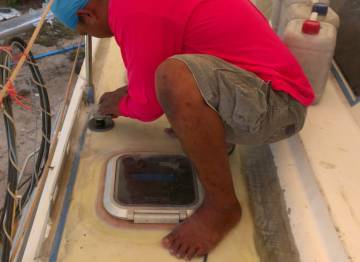 On Sunday Houa cut out most of the acrylic sheets for our hatches. 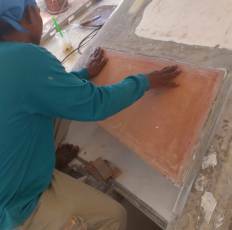 This is a private contract we have with him, to cut the acrylic to the correct dimensions and glue them in with the correct silicon adhesive. He's charging us $20 each for the 10 small hatches and $40 each for the 2 big fo'c's'l hatches. Somewhat more than we thought we should pay, but Houa's got 4 young kids and only gets $33/day, so we're OK with this. 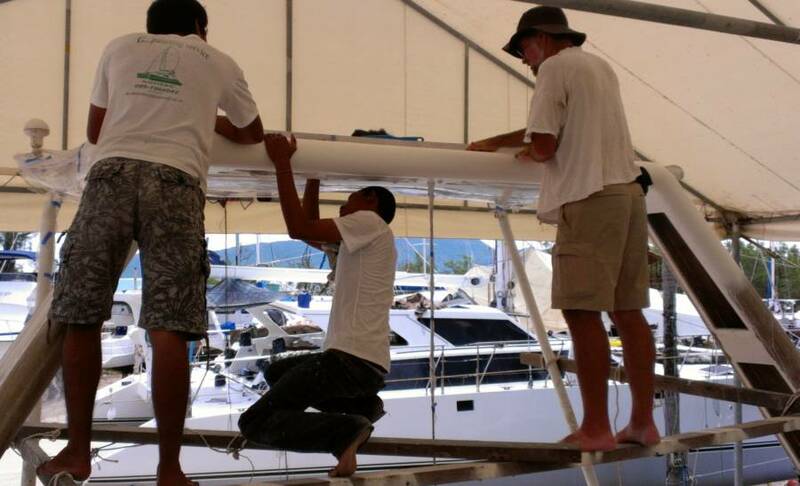 Baw started the day working on the gelcoat around the starboard salon port. He wet‑sanded it flat and smooth, and then polished it. It's lovely - slippery smooth - but it needs another coat, as there are some small holes. Not sure why he went to all the trouble to polish it if he's going to spray over it, but what we don't know about gelcoat fills volumes. Since they'll be needed soon, Jon attacked the hatches that go in those forward salon ports. They were very difficult to remove back in March, and one of them needed the bolt heads drilled off. But the bolts (just threads now) still need to be removed. Jon tried attacking them with a propane torch and a pair of small vice‑grips, but in the end he took the frame to a local machine‑shop and asked them to remove the 4 stuck bolts. After lunch we had a meeting with Golf about future work. The bimini is the next up, of course, and Baw will finish the steps over the salon ports in between bimini jobs. When the gelcoat is finished we hoist it into place and Jon drills, taps, and bolts it to the targa‑bar, with some white Sikaflex to keep it waterproof. Then we build the forward supports out of a bit of foam (to give the arms shape) and lots of fiberglass (for strength). After that, Houa goes inside to work on Ocelot's woodwork (galley sink, front of the salon, all 4 bathrooms, and Amanda's bed) and the rest of us start building sheets of gelcoat antiskid and epoxying them down to the deck. But this is all future talk, and seeing is believing! Golf reiterated his promise of another worker later this week, but that's only 3 and we want twice that many. A strangely slow day at the yard, but fun with Rachel's bright and sunny disposition there to help out. Sue and Rachel arrived first, to learn that Golf and Baw were out tracking down all the materials that we requested yesterday afternoon, such as thinners and more filler powders for the gelcoat. Houa set to work up on the port side deck with a grinder and sanding pad. His goal was to clean up the fiberglass that abutted the toe‑rail. The aluminum rail has been covered in blue tape for many months, put on to protect the toe‑rail when the decks were repaired last February and March. Now that we're about to begin gelcoating the deck, it's time (or way past time!) to get the tape off, clean up the aluminum rail, and sand the fiberglass smooth right up to the edge. 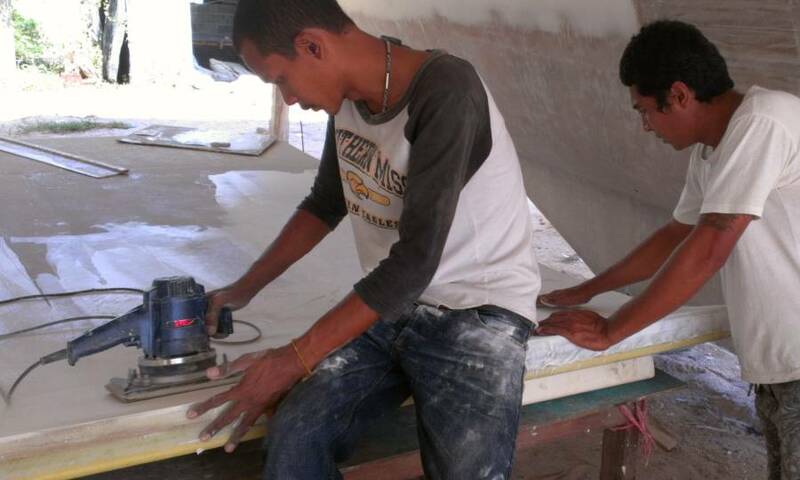 Unfortunately, we only got a few linear feet done, as there was a moratorium on dry grinding and sanding in the afternoon because the boats on each side of Ocelot were being spray painted today, and no one wanted more dust particles in the air. While Houa was sanding (luckily with the breeze and the commercial blower sending the particles away from the cockpit) Sue and Rachel camped out in the cockpit to work on the seemingly endless job of cleaning up the deck hatches for re‑glazing and adding new gaskets. They used the new Thai product "Silicone Off" with reasonable success. Rachel also took some time to use R2D2, our big shop vac, to get some of the dust out of the salon. After lunch Baw spent time on the port foredeck wet sanding and then spraying more gelcoat around the port‑light. 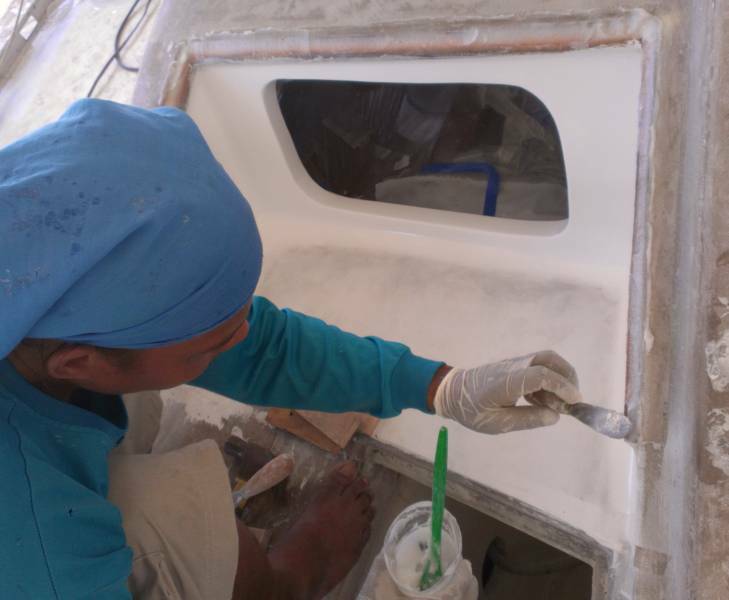 At the end of the day he was down under Ocelot sanding yesterday's gelcoat on the bimini and preparing to add more filler. Houa spent the afternoon working with his new, sharper router bits cleaning up the edges of the acrylic hatch windows that he cut on Sunday. Jon and Amanda worked on polishing the boom, as it was out of the sun and so a much nicer place to work than the hot, shiny mast. They took time after lunch to go to Big C, a large supermarket about 10 miles (16km) away to try and stock up on some food items not available in Ao Chalong. Then they hit the boom again for a couple hours in the late afternoon. Amanda got her first ever motor scooter lesson in the late afternoon, and ended up driving Jon home! Go, girl! Best news of the day was the US election results. Amanda stayed in her apartment until lunchtime and brought us the news, although the boatyard office was also watching the results. Much of the rest of the world (certainly everyone we talked to here at the boatyard) was very relieved that Obama will be President for the next 4 years. Nice to have a leader who actually knows something about the rest of the world. It was a sluggish day on Ocelot. Sue spent the morning and some of the afternoon on the details of the hatches. Yes, still. Long, long job. Jon and Amanda took turns working with the grinder and a polishing disk to bring the boom up to snuff. 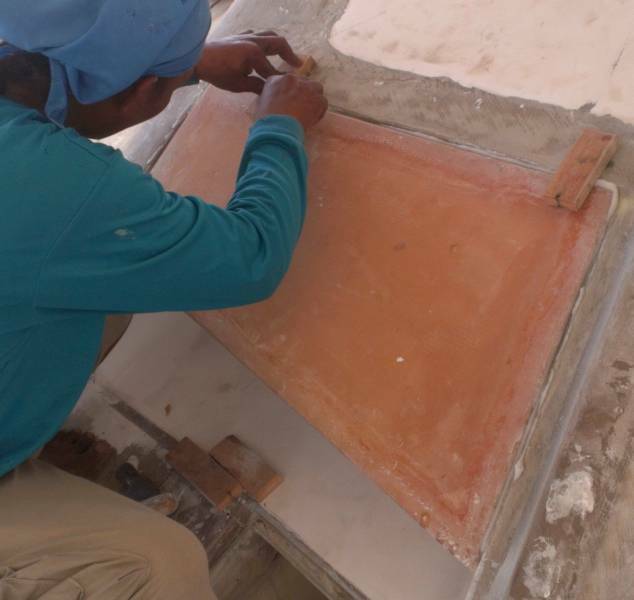 We are still trying to figure out how to give the aluminum spars the right finish before applying the Nyalic. We are not happy with how easily the aluminum scratches where it has been sanded with 400 grit. Jon tried an experiment with finer papers, but the jury is still out. 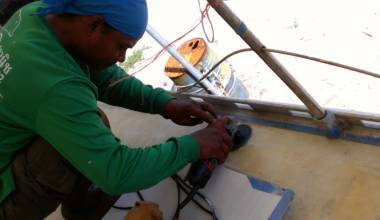 As for Houa and Baw, we got about 1 hour of half‑hearted sanding of gelcoat on the bimini out of Baw before he took off for home in the afternoon. Golf chased him down there but was unclear about why he left the yard. 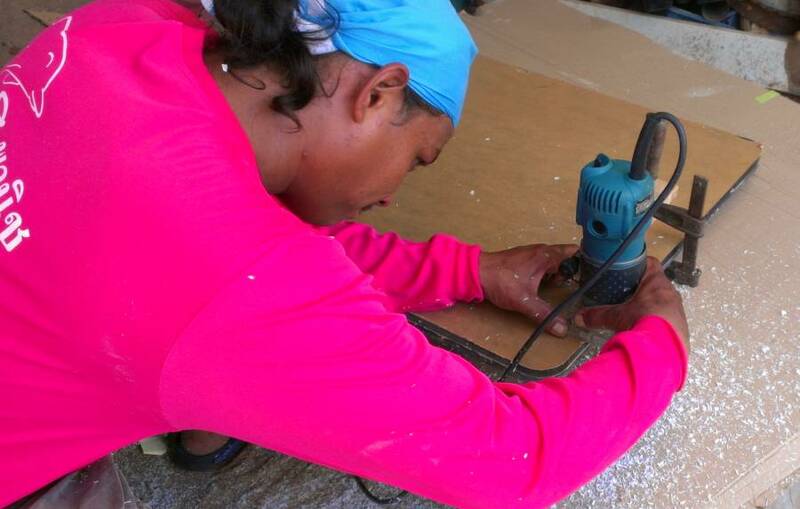 Houa put in a longer day, sanding back the epoxy and fiberglass along the toe‑rail on starboard side. A lovely day and Golf's team accomplished another (minor) goal. 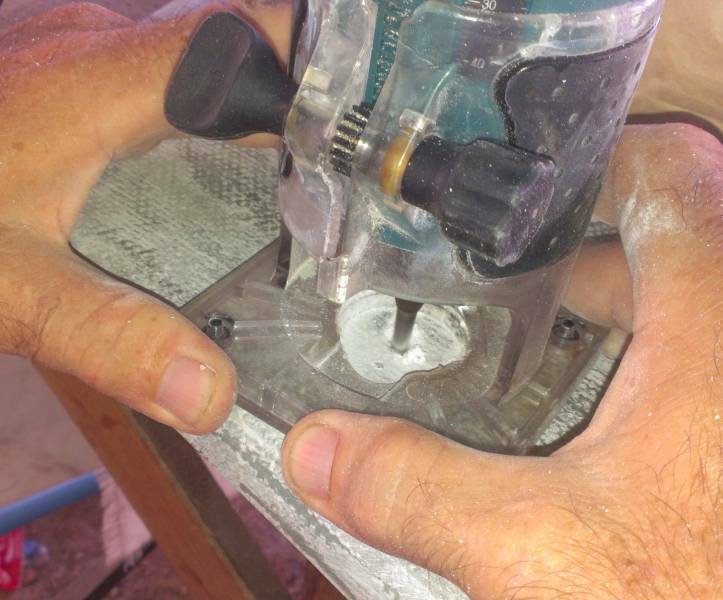 Jon had a bit of a scary moment when polishing the boom - the coarse polishing pad caught on a fitting and wrenched the powerful grinder out of Jon's hand. It leapt into Jon's lap, shredded his pants, and made several circular cuts in his upper thigh before eventually falling to the ground. It has no "dead‑man" switch so it leapt around for a while until it could be unplugged. So Sue and Rachel went searching through the many boxes on our storage unit looking for any work shorts for Jon. They eventually found some and while they were at it they organized some of the boxes, putting things that we'll need sooner in some of the closer boxes. After that, Jon decided to work on the 2 foredeck hatches. He bought some bolts and nuts at the tiny Chinese‑run hardware store on the main road and found that they were completely non‑magnetic, which usually means high‑quality stainless steel. It's nice to know that we can get high‑quality stainless steel so close by. The finger‑pulls stick down into the hatch lids, so Jon borrowed Houa's router to cut out the fiberglass so the finger‑pulls will sit down correctly. Then he dug out the foam under where the screws will go so those areas can be filled with epoxy filler laced with fiberglass strands. 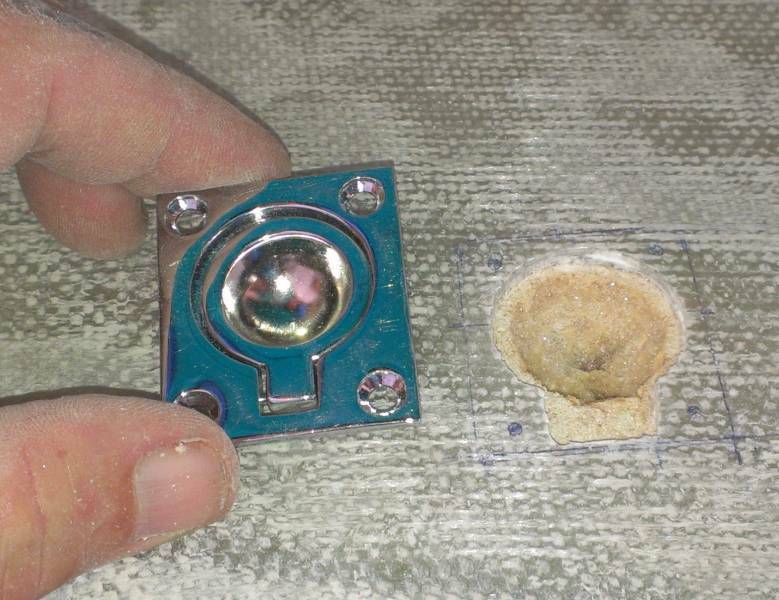 Then the mounting holes can be drilled and tapped and the finger‑pulls mounted. The hinge‑bolts into the hatches were easy, as they go through solid fiberglass, but the other side of the hinges, where they bolt to the foredeck, is in an area where we can't get to the underside to put on a nut. So Jon found a short piece of stainless steel rigging‑wire, un‑laid 1 strand, straightened it, and bent the end over into an L shape. He drilled the hinge mounting‑holes through the glass and into the foam, then put his bent wire into the drill, inserted it into the hole, and used it to shred the foam under the hole. 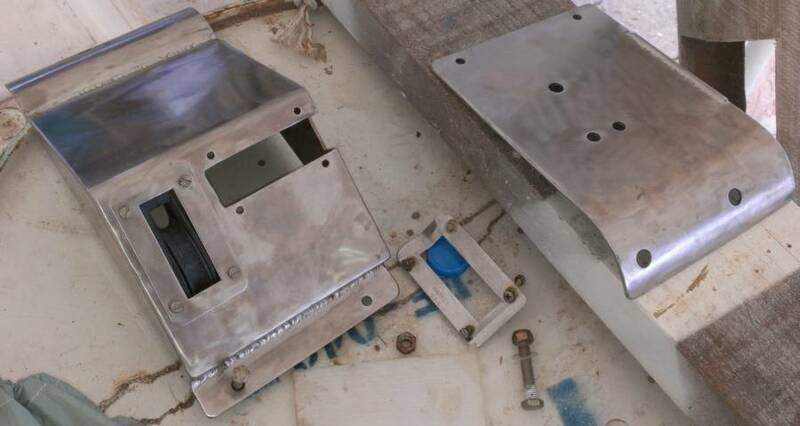 Houa can now fill the mounting holes with glass laced epoxy filler and we can then re‑drill and tap the holes so the bolts can just screw right into the deck. Baw and Houa worked on the shelves above the forward ports. Baw polished the gelcoat on the underside of the starboard shelf and then Houa epoxied it into place. It still needs to be fiberglassed, as it's just raw foam on top. We hope the glass will strengthen it sufficiently, as it's quite flexible with only glass on the bottom. 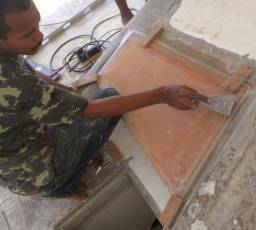 Baw continued by sanding and polishing the gelcoat on the portside shelf, and Houa was preparing to epoxy it into place as we left at the end of the day. Amanda continued polishing, working on both the mast and the boom. The noise of the grinder is annoying but Amanda's plugged into music so it doesn't bother her much. It's nice to know the work is getting done. Rachel was helping clean up the hatches, and Sue was cleaning up the mainsheet track that goes on top of the targa‑bar. Once we mount the bimini to the targa‑bar, we'll be able to mount everything else there as well. We had an interesting Facebook discussion last night with our wonderful previous worker, Max. Since we last saw Max in May his wife's had a cute baby boy and Max got a good paying job driving a truck. Max doesn't speak much English so he has to run everything through a translator program. I suspect that English to Thai works OK, but Thai to English is hilarious - and completely incomprehensible. But it seems that Max's wife didn't like him being away so much of the time and she wants him to quit driving the truck. So he may come back to work on Ocelot, which we'd LOVE. Max is a very resourceful fiberglass man who can take a job and run with it, with minimal supervision. Golf said that Max was supposed to come to the boatyard this afternoon, but he hadn't shown up when we left at 5:15. We were supposed to get a new worker yesterday, but apparently we'll get him tomorrow. Still no signs of Max, but maybe he's taking a few days off between jobs to play with his new son. Houa stayed late last night and finished epoxying down the portside shelf in front of the salon. Today he covered that shelf in 3 layers of biaxial glass. We're very interested to see if that will be strong enough to stand on, but it hadn't cured by the time we left for the day. While he was playing with epoxy, Houa filled up the areas that Jon had de‑cored yesterday: the 4 hinge bolt holes and the finger‑pull hole on each hatch area. Once these cure the hinge bolt holes will need to be drilled and tapped, and the finger‑pull holes will need to be cleaned up and routed out again so the finger‑pull can mount flush with the top of the hatch. Baw was spreading gelcoat around the starboard shelf area. This seemed very strange to us, as some of the gelcoat was going where Houa needed to lay fiberglass when he glasses in the starboard shelf. That area needs to be gelcoated eventually (as does the whole deck) but why do it now when it gets in the way of other work? 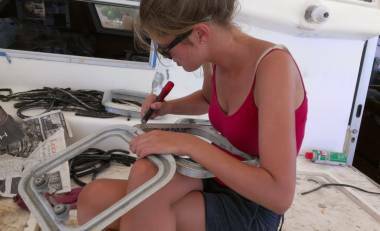 Why not work on the targa‑bar or the bimini, which seem to us to be a higher priority. We talked about this with Golf when we could. Hopefully Baw will be working on the targa‑bar tomorrow. Jon dug out 2 stainless steel fittings that go over the horizontal davit supports and mount to the targa‑bar. 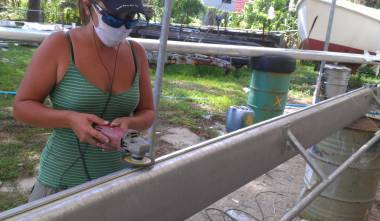 These stainless plates each support a turning block for hoisting the dinghy, and need to be mounted before the bimini goes on. Jon cleaned up and polished the stainless steel, but found that one of the turning blocks was missing several ball bearings. Apparently they weren't UV resistant, and the sun simply rotted them away (Thank you, Harken). So Jon went up to Rolly Tasker, which is primarily a sail‑maker but has a chandlery for that sort of thing, and found a reasonable but less beefy replacement for about $45. Amanda managed to finish polishing the boom, or at least, the side that's facing up. So we flipped it over and she started polishing the bottom. Sue and Rachel spent much of the day sorting through all our junk in the storage unit. How we're going to get all that junk back into Ocelot is still a mystery to all of us. This is Rachel's last day with us for a while, as her parents have come back to their boat in Langkawi, and she wants to go down and be with them. So we'll probably go out and do something fun for dinner tonight for Rachel's last night. A good day! Sue woke early and escorted Rachel into Phuket Town to catch a bus to Satun, where she can catch a ferry to her parents in Langkawi, Malaysia. Unfortunately, the bus arrived late so Rachel had to get a $13 room for the night. Baw started off on the targa‑bar. There was a strip along the top that hadn't cured properly, and the back needed to be polished so Jon could put the solar panels back. Baw worked much of the day up there wet‑sanding and polishing the gelcoat and got most of it looking great. There are still a couple of tiny holes that he wants to fill in, but that shouldn't take long. 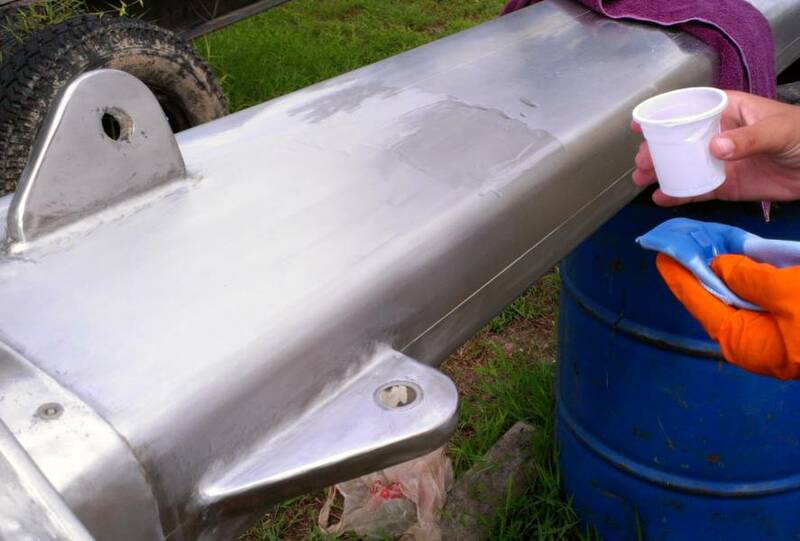 When he finished the top of the targa‑bar, Baw went back to sanding the filler up on the starboard bow. Sue continued her organization, taking inventory of all the boxes of stuff on Ocelot and asking Jon what the strange bits are if she didn't know. She downloaded a note taking application for her Kindle, and is using that to keep track of where and what everything is. Golf has told us that Houa will be finishing the galley and other woodworking projects starting next week so he asked us to clear what we can out of Ocelot, or at least get it out of the way. Several of the hatches were wrapped in paper and stored away, and several items that we won't be needing for a while (like mast bits) went to the storage unit. Houa glassed in the starboard step above the forward port‑light. Jon tried standing on the portside step and found that it flexed a bit (maybe ¼" or 6mm) when he stepped right on the edge, but it's pretty solid and shouldn't break. Amanda continued polishing the mast and boom. She's almost finished with the the boom. But before she leaves on her jaunt up to Cambodia with a friend, we want to try out some of this expensive Nyalic coating that we've bought. We've decided to use a section of the mast between the first and second spreaders as our test section, so this afternoon Amanda cleaned and sanded that area with 400 and 600 grit sandpaper, giving it a nice brushed finish. We may go in on Sunday (after our traditional Sunday brunch) for a final degreasing, alcohol cleaning, and then applying the Nyalic. Saturday we typically bring out some beer and chips for the guys, and talk with Golf about what work is happening and what we want to do the next week. Golf wanted to put more gelcoat filler on the decks to make them smooth for the antiskid, but we think the decks are smooth enough as they are (and we don't want to put more filler down either). 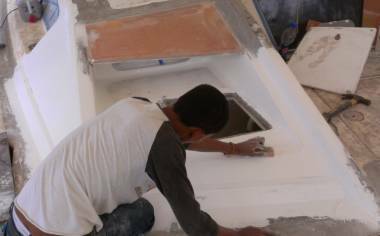 So Houa will move inside to do his woodworking, and Baw and the new man will work on gelcoating the underside of the bimini. We'll also examine the decks with Golf to see if or where filler is needed before the antiskid goes on. A salute to our veterans and deployed military on this, our Veteran's Day. 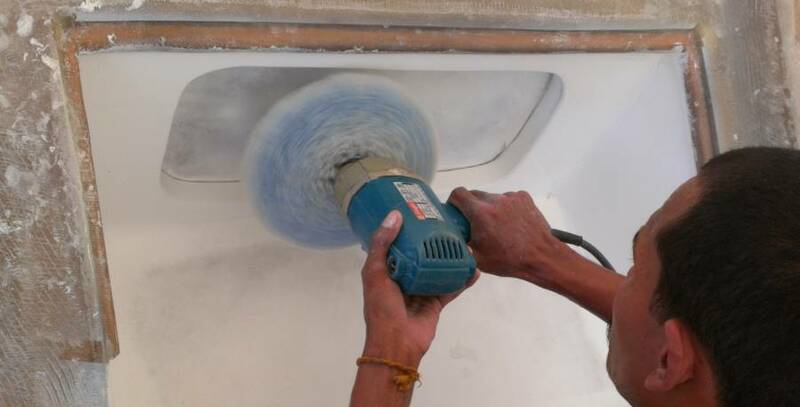 We don't usually come in to the boatyard on Sunday, but we wanted to conduct a quick test with our new mast coating, Nyalic, and we wanted to do it in as dust‑free an environment as possible, with nobody driving around the yard. 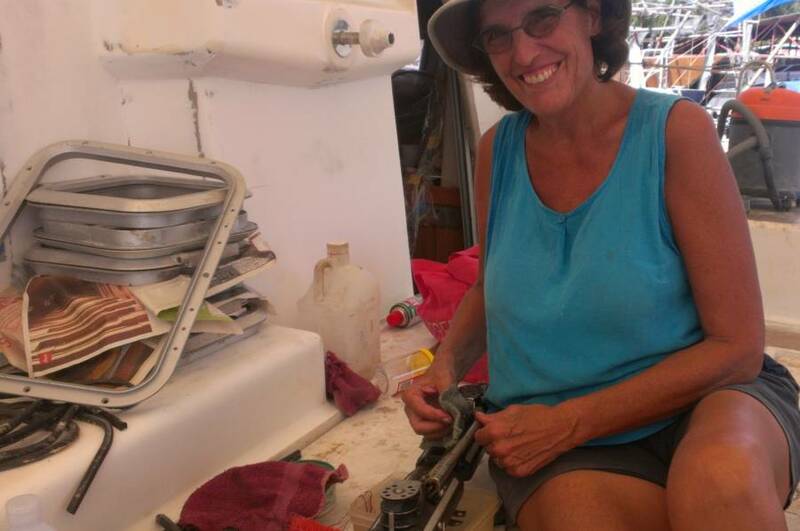 Also, Amanda has been working hard on polishing the mast and boom, and we wanted her to get some closure before she goes off gallivanting around Cambodia on Tuesday. Our mast test section is just above the first spreader. Amanda gave it a final wet‑sanding with 1000 grit yesterday, so today we degreased it to get all oils off, then we cleaned it with methylated spirits (denatured alcohol) and let it dry. The Nyalic has the consistency of varnish, but it can be applied with a cloth. 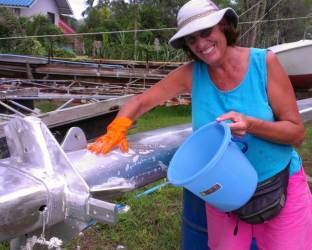 We'd bought special lint‑free cloths, so we poured a bit of Nyalic into a plastic cup, dipped in a bit of cloth, and wiped in onto the mast. It wiped on very easily. Tomorrow we'll see how durable the finish is.